Sasha Farina. Paper. Play. 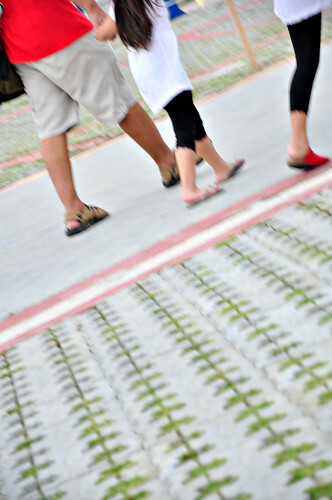 : Just keep walking. . . I didn't manage to scrap for Pencil Lines #127, but you guys must totally hop on over to check it out. Our guest this week, is my beautiful, funny, oozing with talent friend, Sharon Ong! This girl is crazy I tell you, she can scrap like no other, if you meet her, you'll always leave with a smile on your face and head bursting with inspiration! Speaking of which. . . I miss her a lot and definitely have to make that trip downtown soon! 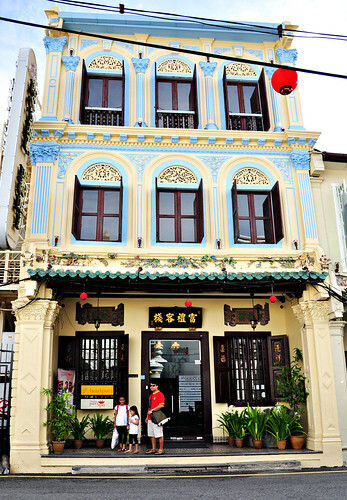 Charming little boutique hotel, albeit a bit spooky according to us. LOL. Yes, those are the loves of my life waiting patiently for me to cross the road and get to them. 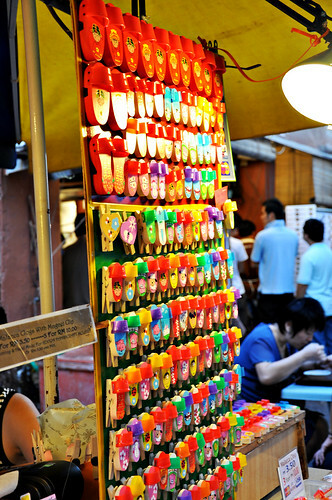 Went to the night market at Jonker Walk, just the girls and me. Daddy was napping in the room. See those tiny wooden slippers? Adorable! we bought ten, two already on my fridge door, another 8 on their way to friends of the girls in school. I took maybe 5 pictures there, too many people and frankly, I would rather hold on to my girls than the camera! LOL! Very narrow street in front of the hotel. Then we're off to Gadek Hot Springs, where we proceeded to soak our hands and legs in the really-hot water. It was almost boiling! Crazy. No pictures at-all. . urmm. . . because of something I can't remember, but I know I was upset at someone or something and it just seem so silly now. Duh! I don't snap pictures when I'm not happy, no idea why, but I just don't. Happy face! Those tiny teeth, they're gonna be gone soon and I am soooooo gonna miss them like crazy! This shot is almost perfect, except for the fact that Nidhi's hairband has slid down and resembled a mini turban-like headgear. LOL. Wanna know why? Scroll down. . .
LOL! She freaked out a bit when the snake flexed its muscle, that's why. The one family shot that we had and he had to close his eyes. LOL! Sweet! I don't care, really. . . I am still gonna scrap or do whatever I want with this pic. Who says you can only scrap perfect pictures? Guess one lucky girl didn't need to walk as much. Un-happy face. Tired from too much walking. Tired from watching someone else got to be carried on the shoulders and the back. .
Then we walk somemore. . this shot is blurry, not in perfect composition, I wasn't even looking thru the viewfinder anyway. Accidental shot. Very much loved accidental shot. Sweaty. My growing girl. . can you see me in her? 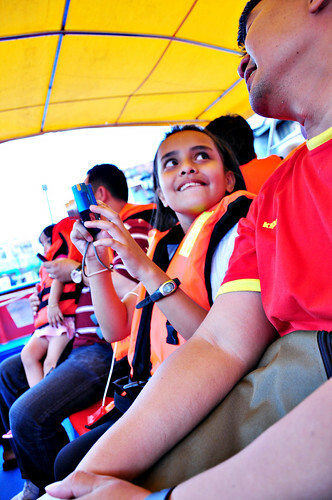 The Malacca River Cruise which is boring with a capital B. LOL. 45 minutes of my life I will never get back. Then she got her turn. LOL. She is simply too tall to be carried like Nidhi. . we giggled and put her down. We continuted being touristy after that, went on Taming Sari Tower ( I had grand plans to capture the sunset from 80 metres above, but giddiness took over and all I can do was pretend I was enjoying the ride, smile and pray I can keep my stomach content where they're supposed to be.) LOL! The end of Malacca trip! Mersing coming right up. Are you guys still here? LOL. . .Thank you! See you soon! These are AMAZING photos, Sasha. Wow! I am still freaking a little bit over the snake pics. You've got some brave girls! 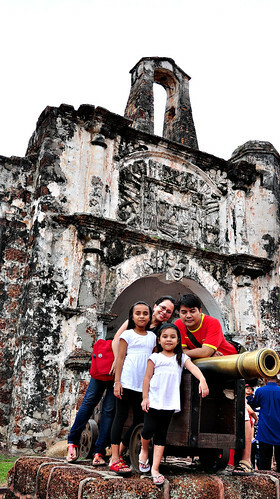 Wow those are nice shots of your visit to Malacca!! Lovely trip. AMAZING photos! !wowowww Love those photos!!! great pics....I love all the color in them. Can't wait to see more... and no, it wasn't boring. Beautiful pic's, love that building in the first pic, wow, just beautiful!"!!! Amazing pictures! Can't wait to see them make their way onto your layouts. 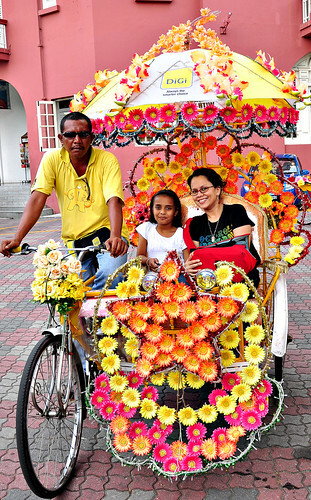 I especially love the trishaw covered in flowers, so pretty. 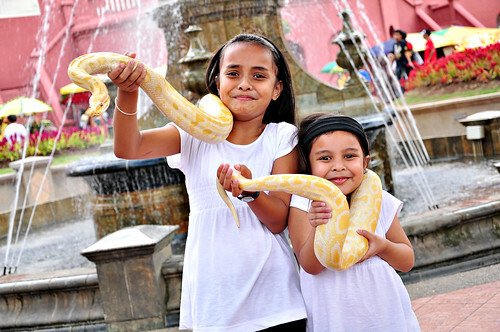 Your girls are so beautiful - and yes, SO brave holding that snake! wow! amazing shots. love all the color. 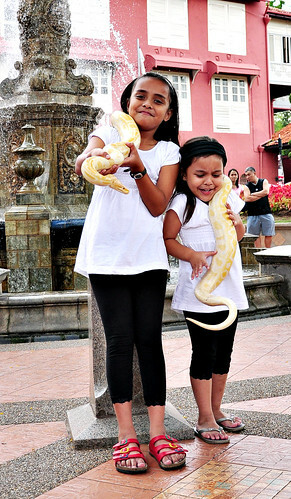 your girls are VERY brave holding that snake...yikes! and those little wooden shoes...too adorable. 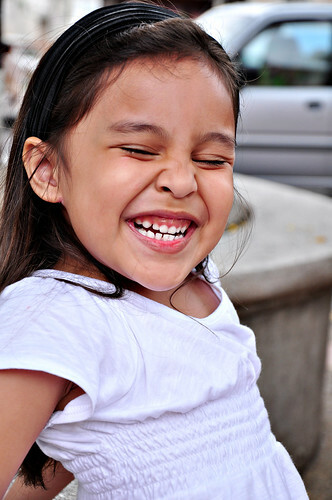 OMGOSH girl, I just LOVE your photos!! CRAZY GREAT! OOohhhhh! 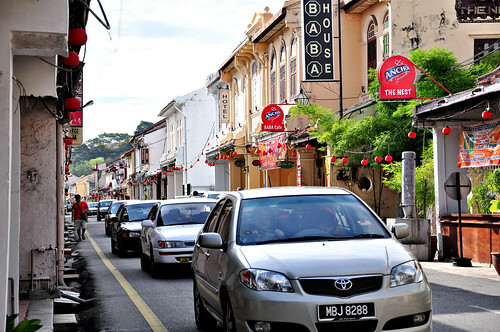 I so wanna be at Malacca right now babe!!!! I miss my Assam Laksa!!! Glad to see you and your family having fun!!! Ciao Sasha!! 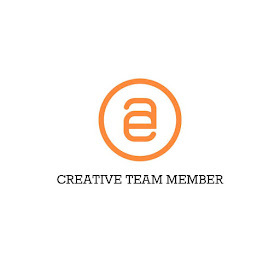 thank you for the visit and the comment on my blog! I'm very happy to read a beutiful comment from a fantastic scrapper like you! such great photos! and love that you got in a few of them too! now go and order some enlargements girl!!!!! Love the pics and cuties!!! Love to visit there someday looks so fun and beautiful! I LOOOOOOVVVE those amazing pics... your family is so nice... and Malaysia...wow! so far from Quebec... I wanna be there!!! Thank U for sharing!! !